The economic performance by the US and Japan in the fourth quarter of 2014 were both worse than market expectations. China has been planning to revise down its annual growth target to 7% for 2015. Nevertheless, the Euro zone and ASEAN outperformed the global market anticipation. In a nutshell, cons dominate pros, whereas uncertainties take over sureness in the world economy. 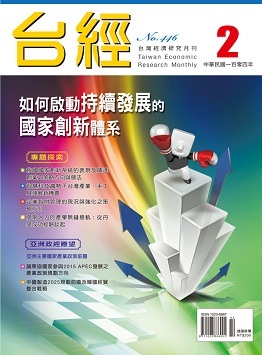 The Taiwan Institute of Economic Research (TIER) issued its business composite indicators on February 25, 2015. The manufacturing composite indicator shows some promising harbinger; however, the service and construction indicators provide rather pessimistic signs. Germany initiated the "Industry 4.0," American Planned the "Advanced Manufacturing Partnership Scheme", British and S. Korea respectively proposed the "high value manufacturing strategy" and "manufacturing innovation 3.0 Strategy" as their forward-looking policy-related schemes. The growing intelligent trend implies that the emerging fields can happen by applying the ICT technology solutions on various fields, and thus if Taiwan could integrate ICT and machinery tool to its smart production, it would benefit Taiwan in global supply chain.